Something old, something new, something borrowed, something blue--and something that won't wilt. The jewelry bouquet has been showing up, off and on, over the last few years. These days, reducing costs and waste by replacing perishables such as cut flowers makes both economic and ecological sense. So brides are turning old family jewelry, thrift store finds and new vintage-style components into bouquets that will never wilt or fade. Jewelry bouquets are created using not only brooches, but also earrings, sweater clips, bracelet centers, necklace focals and other jewelry components. While some brides may prefer interspersing brooch-based flowers among real or fabric blossoms, many have opted out of flowers entirely in favor of the more permanent keepsake of the jewelry bouquet. Most jewelry bouquets use 50-85 pieces of jewelry, often a mix of sentimental family pieces, personal jewelry and recently purchased pieces. Choose which pieces to use by keeping a few guidelines in mind: size, color, finish, condition, personal meaning and appraised value. First of all, it's best to not use jewelry that is very expensive. While this bouquet won't be tossed after the ceremony, it is going to be handled a lot: set down on various tables, picked up, shown off, investigated by flower girls, passed around to bridesmaids and possibly dropped by a verklempt father-of-the-bride. It would be a shame to lose or damage an expensive piece of jewelry. For many of the same reasons, be careful when choosing sentimental or family pieces of jewelry. Decide whether damaging or losing Grandma's brooch, Mom's locket or Grandpa's cuff link would ruin an otherwise joyful day. Different families place different importance on sentimental pieces--the only answer that's truly correct is the personal one. Be sure to go over every piece of jewelry and check its condition. If it is rusted, cracked, bent, twisted or the structure is in any way damaged, avoid using it. It could fail in the middle of the ceremony, leaving an unsightly hole in the bouquet or could open, stabbing the bride. Likewise, check the surfaces of plated, enameled and epoxy-coated pieces for cracking, peeling and chipping. Set those pieces aside and avoid using them. When choosing jewelry for the bouquet, keep in mind the wedding colors. Jewelry bouquets can be designed to blend with the rest of the wedding or stand in bold contrast. The same ideas apply within the bouquet itself: consistency or contrast. If opting for consistency, choose a single metal (various gold finishes, etc. ), a single finish (all antiqued) or other visual factors. Contrast-based design can include mixing two finishes or metals equally, assembling a bouquet with a few contrasting accents or other creative mixing. Choose jewelry pieces in a variety of sizes for a visually interesting bouquet. Mix brooches, earrings and other jewelry components freely to create an arrangement that is balanced, dramatic and attractive. 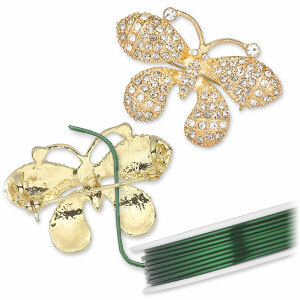 Attach green-coated wire to the backs of the jewelry pieces. Each piece will require a different attachment method, so some experimentation will be necessary. Small or lightweight pieces will need only a wire or two; larger, heavier pieces may require more. Use enough wire on each jewelry piece to ensure that it stands upright on the end of the stem, like a daisy, without drooping or sagging. Wrap each stem with corsage tape or florist tape to keep multiple wires together and give a more polished look to each "flower." Assemble into a bouquet. Some brides like to mix live, dried or artificial flowers into their jewelry bouquets. Others prefer to use organza ribbon, lace, fabric or other fillers to conceal the spaces between the pieces of jewelry or to frame the entire bouquet. Wrap the gathered bouquet with corsage tape so it stays together. Cover the tape with ribbon, fabric or a professionally made bouquet holder. Use duplicates or leftovers to create boutonnières for the groomsmen and dads, smaller bouquets for bridesmaids and corsages for the mothers of the couple. Then everyone in the wedding party can have a permanent token of an incredible day.